Child & Birth Injury Lawyer > Crib, Toy & Child Product Recall Updates from Lawyer Jeffrey Killino > Accidents > Who Can Be Held Responsible When Children Are Injured or Killed in School-bus Accidents? Who Can Be Held Responsible When Children Are Injured or Killed in School-bus Accidents? Every year, millions of parents across the United States place their children’s lives and safety in the hands of school-bus drivers. Yet, approximately 17,000 children, on average, are injured or killed in school-bus accidents every year, according to some statistics. While many school-bus-related injuries are sustained in non-crash incidents, many are sustained in crashes caused by the negligence of school-bus drivers. School-bus-driver incompetence is a matter of continuing and growing concern across the country. Drivers are often inadequately screened before being hired or improperly trained thereafter. When unfit or careless drivers are entrusted with the operation of school buses and the transportation of school children, preventable injuries and deaths to children can easily occur. On Monday, January 5, 2015, for example, one teenaged student was killed and 11 others injured near Larimore, North Dakota, when a school-bus driver failed to yield, at a train crossing, to an oncoming train. Though the railroad crossing was not equipped with railroad-crossing arms, it was equipped with railroad signs and a stop sign. The bus is reported to have been struck on its right-front side as the driver (who also died in the accident) attempted to make it across the tracks. In addition to the negligence of school-bus drivers, school-bus crashes may also be caused by the negligence of other drivers or by defects in school buses or other vehicles. Child-injury attorney Jeff Killino has extensive experience with child-injury and wrongful-death cases, including those arising out of school-bus accidents due to negligence or defective vehicles. If your child has been injured or killed in a school-bus or other vehicle accident, attorney Killino and his esteemed team of child-accident and school-bus-accident attorneys can help you obtain the compensation you deserve from the responsible parties. When a school-bus accident is found to have been caused by the negligence of a driver other than the school-bus driver, the other driver may be held liable in negligence personal-injury or wrongful-death actions for children’s resulting injuries or deaths. 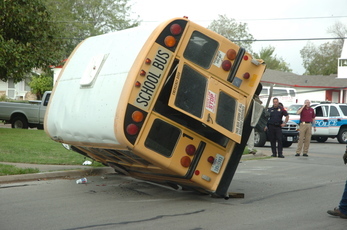 If an injury-causing school-bus accident is determined to have been caused by a defect in the school bus or in another vehicle, on the other hand, the vehicle manufacturer and others involved in the production and distribution of the defective vehicle may be held strictly liable (without necessity for proof of negligence on the part of any of these defendants) for children’s resultant injuries and deaths through products-liability personal-injury or wrongful-death actions brought against such products-liability defendants. When a school-bus accident is caused by the negligence of a school-bus driver, however, the driver and the driver’s employer may be held liable for children’s school-bus injuries and deaths only under certain circumstances. If the school-bus involved in an accident is owned by a public school, for instance, and the driver is employed by the public school, both the driver and the driver’s employer may be protected from liability by state governmental immunity laws. In some states, total immunity is granted to public entities and employees for injuries and deaths caused by public entities’ or employees’ negligence. In others, this immunity has been exchanged for limits or caps on damages that may be recovered by injured victims or deceased victims’ survivors. In most states, governmental immunity will be unavailable to public entities and employees whose gross negligence, recklessness, or intentional acts have resulted in someone’s injury or death. School-bus drivers who are not employed by public schools and who drive privately-owned buses are also not protected by governmental immunity. These drivers and their employers may, therefore, be held liable for children’s school-bus injuries and deaths caused by bus-driver negligence. In addition, school-bus drivers’ status as common carriers makes their negligence easier to prove, as common carriers are held to a higher duty of care than that required of other drivers. A school-bus driver’s failure to stop at a railroad crossing and to proceed when a train is approaching is likely to be considered driver negligence under most states’ laws. In fact, the violation of state railroad-crossing laws may be held to constitute negligence per se by drivers such as the one involved in the North Dakota crash. Most states require school-bus drivers to stop before proceeding across railroad tracks. In North Dakota, for instance, with limited exceptions, school-bus drivers are required to stop at allrailroad crossings, within 50 feet but not less than 15 feet from the nearest rail, regardless of whether the crossings are equipped with stop signs, crossing arms, or other warnings or protections. ND Stat. §39-10-43. After stopping, a school-bus driver must listen and look in both directions for any approaching train or signal indicating an approaching train and may not proceed until the driver can do so safely. ND Stat. §39-10-43. The school-bus driver involved in the fatal January 2015 crash is likely to be found to have violated this law and to have negligently caused the collision. If the driver was employed by a private company or school, the driver as well as the driver’s employer may be found liable for the death and injuries sustained by the children as a result. A private driver’s employer may be held vicariously (indirectly) liable for injuries and deaths caused by the negligence of its employee. An employer may also be found directly liable for such injuries and deaths if the employer is determined to have been negligent in screening, hiring, training, or retaining a negligent employee. The employer may be found liable under such circumstances, under the Restatement (Second) of Torts, Section 308, for negligently entrusting an incompetent driver with a school bus and with the activity of transporting children. Jeff Killino has been recognized around the country as a child-injury lawyer with a fierce dedication for achieving justice for all children who have been injured or have died as a result of medical malpractice, other negligence, or dangerous and defective products. If your child has been injured or killed due to someone’s negligence or a defective toy or other product, contact attorney Killino and his national team of child-injury lawyers for aggressive yet compassionate assistance with your case.